One of the oldest pocket knife styles, the Barlow came to America during the 1600s and was a common tool on the American frontier. This new version of the Barlow, released by W.R. Case in August 2010, brings a new steel to a knife that's a part of American history. Made with blades of raindrop Damascus, a pattern created by master knife-maker Devin Thomas, the new Case Barlow keeps the original look of the frontier pocket blade. Barlow knives have a simple and rugged design with one or two blades pivoting from the oversized bolster. 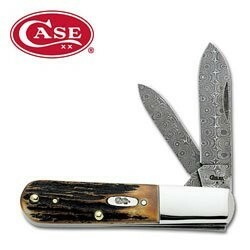 The Case Barlow -- a two-bladed design -- uses a large bolster of polished nickel silver and handle slabs of India stag. The stag antler slabs provide a non-slip texture and a natural look, much like the handles of frontier versions of the Barlow knife. This knife's folded length of 3-3/8 inches fits the pocket neatly, and the wide handle offers plenty of twisting leverage for carving and whittling. A large spear point blade provides the main cutting edge, and the penknife blade handles more delicate tasks. The many layers of folded steel making up the blades add strength to the knife, using similar techniques to that of sword smiths in the Middle East where the term Damascus steel originated. The steel also holds an edge well but shows less corrosion resistance than high carbon stainless steel. Oiling the surface of the blades occasionally is enough to protect the unusual metal from rust. For a different style of Barlow knife, see the Al-Mar Engraved Hawk.